Krysteena's first true companion, and the first pet that I ever really clicked with. I tamed Felrius back in Pandaria, which may not be too long ago for some hunters here, when I was much younger and looking into raiding. 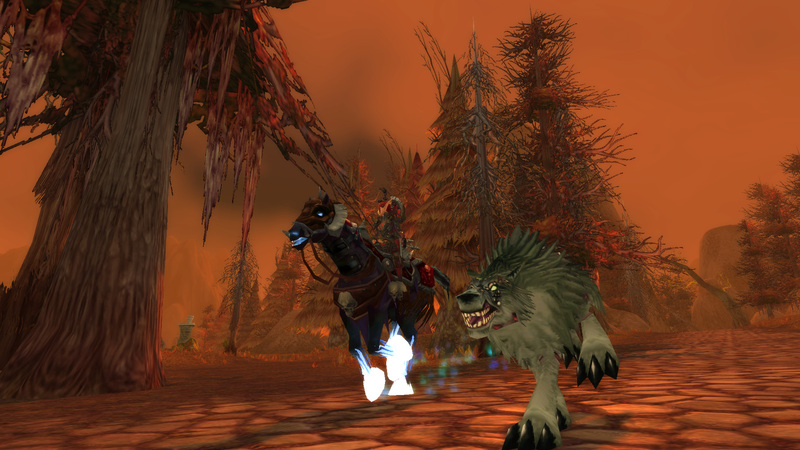 I'd make friends while farming the newly released Zandalari Warbringers, and they told me that getting a wolf was ideal because of the 5% crit howl they had. The diseased wolf was the closest one of hand, and the first I tamed was 'Felrius'. Well, 'Felrias', but I didn't like the spelling so I tamed another and then Felrius came about. 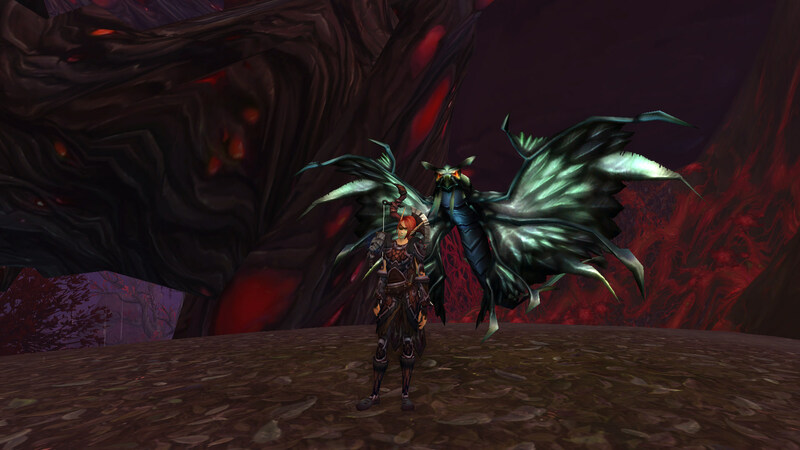 Felrius very much serves as a memoir for MoP, and all memories after that. My first raid, my first group of friends on WoW, my first rare challenge mounts, and even the MoP challenge mounts - Felrius was by Krys' side for all of those things, and he'll be by her side for forever more. He's not exactly the prettiest pet, but he's got so much more attached to him than any other pet I've had, and he was the first pet I ever clicked with. I felt like everyone on the forums had their pet that they were known for, and I lacked that. Then, with Felrius, I did have that. I think. I don't really know if he has that same effect, but I like to think that, if I had a signature pet, then Felrius would be it. Also, if I knew how to make avatars for here, I would want him to be my avatar. 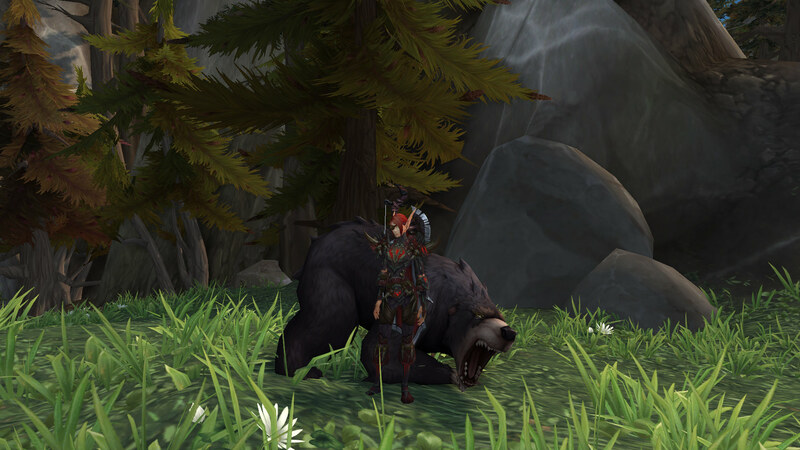 Given to me as a challenge tame, I've always struggled with bears as pets. I like the concept, and I've got no problem with them as pets, but I never had one that clicked. However, when given a challenge tame, I will complete that challenge tame. Hence; Mormont. Named after the family from GoT, which I was, admittedly, watching at the time, he immediately developed a character. He wasn't a massive, uncontrollable beast, but nor was he tame and fragile. Mormont was a true protector of Krysteena, becoming her shield and wall against attackers, and also an effective heat blanket on those long winter nights. 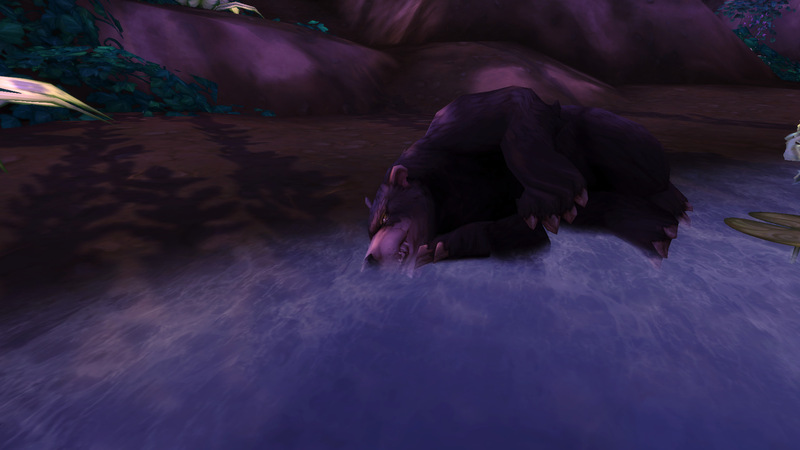 As someone who tended only to have ferocity pets, I was very much surprised to see how well Mormont performed in Suramar - especially the city. That was no doubt because he is a tanking pet, but I like to think that he was just super effective at what he was doing and was fighting to protect his mistress from the corrupt Nightborne. I also like to think that, alongside Krysteena, he understood the injustice occurring in the city, and was also fighting for the citizens of Suramar. In a nutshell, it didn't take very long for Mormont to earn himself a place at Krysteena's side, and he got there so quickly and effectively that Krys is still confused about it. "His exact words were, 'got your back, Jack'." Originally named 'Duskwing', this guy is more of a guilty-pleasure pet than anything else. 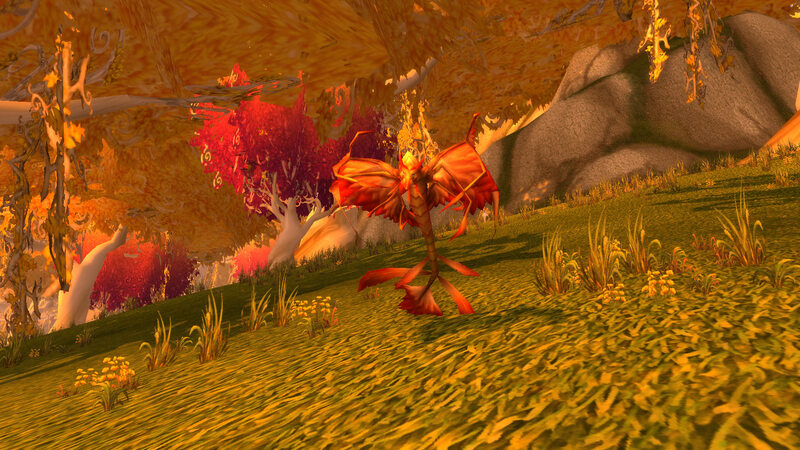 I love dragonhawks, and, upon discovering that dragonhawks came in other colours than gold and gold, I immediately wanted to tame Sunwing. Cue me flying all the way to his spawn point to camp him, and log on a day or so later to see him being killed. Tragic. Regardless, I didn't let it discourage me, and I continued to casual camp him. Eventually, the next time I saw him, he was mine for the taking, and I quickly tamed him with my hands shaking from excitement. I named him the very unoriginal name of 'Duskwing', which was only recently changed to Thalanos upon deciding I wanted a more rp-appropriate name after I thought of a backstory for Krys. He's very much a pretty boy, and I always feel a little proud to have him out for people to see. I don't see many people with dragonhawks, much less the black variant, and he's unique even now. I also feel that time has very much been kind on him, and he's still as rich and vibrant in colour as I remember him being the day I tamed him. "Thalanos, you wouldn't happen to have anything to do with the fact that there's fire everywhere, would you?" 'Arganok' was the name that immediately came to me when I tamed this guy. 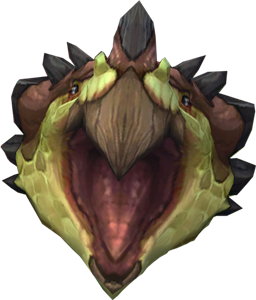 I was thinking close to 'Ragnorok', but that's hardly a name appropriate for a dragonhawk used in rp (as I like to think, despite the fact that I don't actually rp with people). 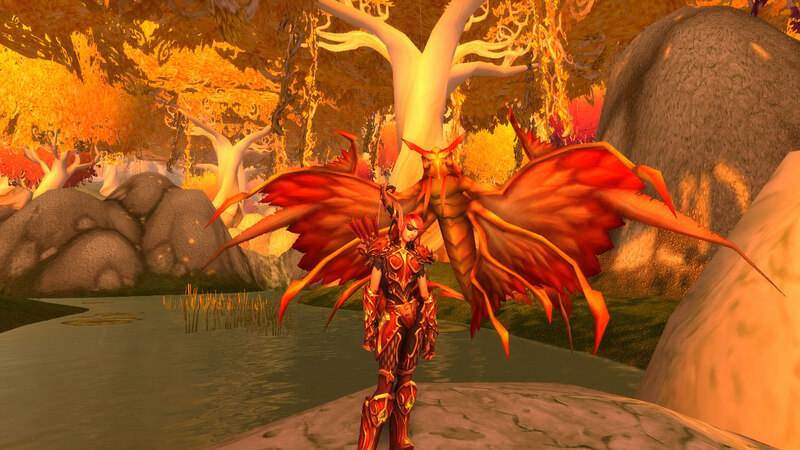 Shortly after giving Thalanos his new name, I wanted to go and get the most traditional Blood Elf pet I could think of; the golden dragonhawk. 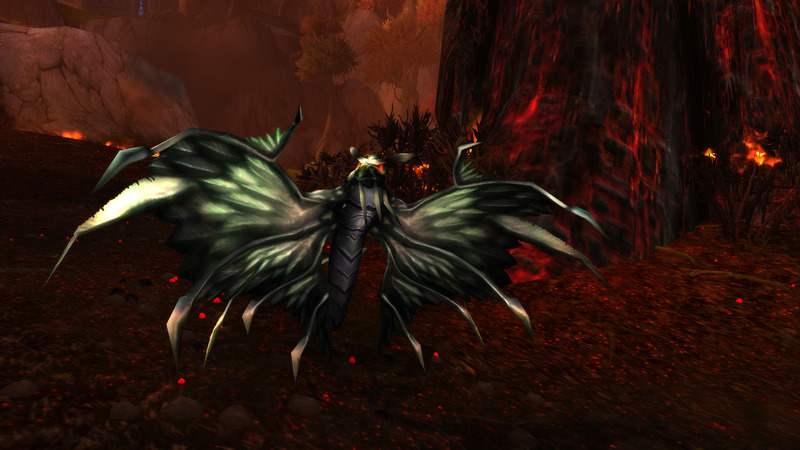 I went to Eversong Woods and began to search for the particular mob that had the same colour as the starting dragonhawk, for sentimental reasons, and came across one. I hit tame, got halfway, and then the dragonhawk dropped dead at my feet. Another low level hunter had seen me taming the dragonhawk and had promptly shot him. It was annoying, but I was expecting it. The same had happened with a different tame, but the tame finished just as it was shot and I'd got my pet and the satisfaction of the other hunter failing to kill my pet. 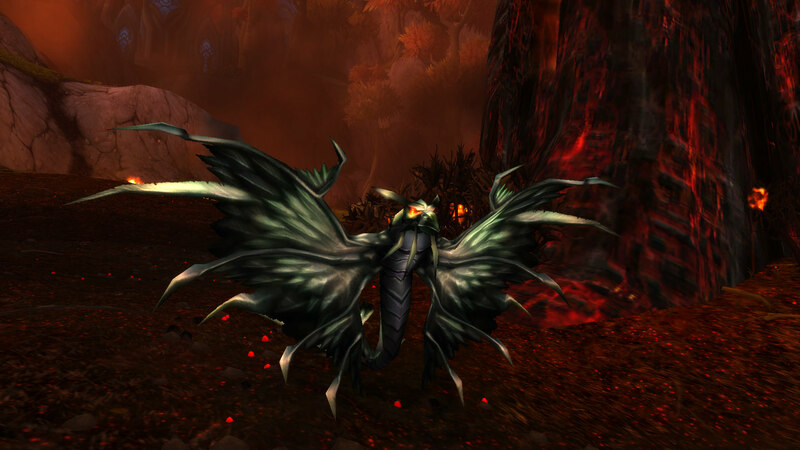 However, the dead dragonhawk at Krys' feet told me otherwise, and so I ran to go and get another. I found another quickly enough, and began to tame. Again, I saw the hunter come over the ridge, and I thought he was going to kill the pet again. At this point, it was already starting to feel a little competitive. However, the tame went off, and the hunter just watched me for a few moments as a nicely matching Hati-infused Thalanos came to my side as well, and I stood victor with my new tame. Thus, Arganok came to my side. He doesn't get used as much, but he's pretty so it's fine. Rak'shiri is, in my humble opinion, the most gorgeous cat model in the game. Even now, with the huge variety of cats we now have, Rak is still extremely precious and The Most Handsome Cat To Exist. 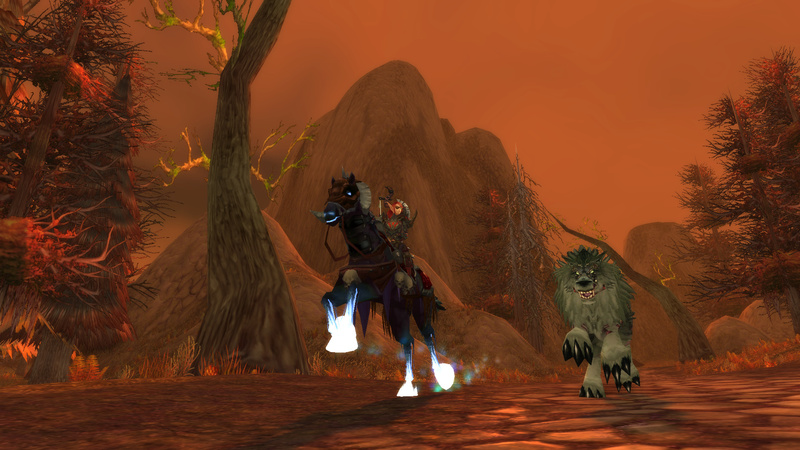 Back in vanilla, I wanted to tame Rak'shiri but he just didn't fit my troll huntress. I had been curious about trying Alliance, just for the Night Elves because ELVES!, so I made a Druid and Huntress to try it out. I absolutely fell in love with the nelf Huntress and even when I've been mostly Horde, she always got a lot of love on the side. Rak'shiri used to be a L57 rare spawn, and extremely sought after (especially once pet attack speeds were normalised). Only the Horde quests could summon his mate that looked exactly like him, so it was actually a better bet to find a rare spawn than find a Horde who would summon. 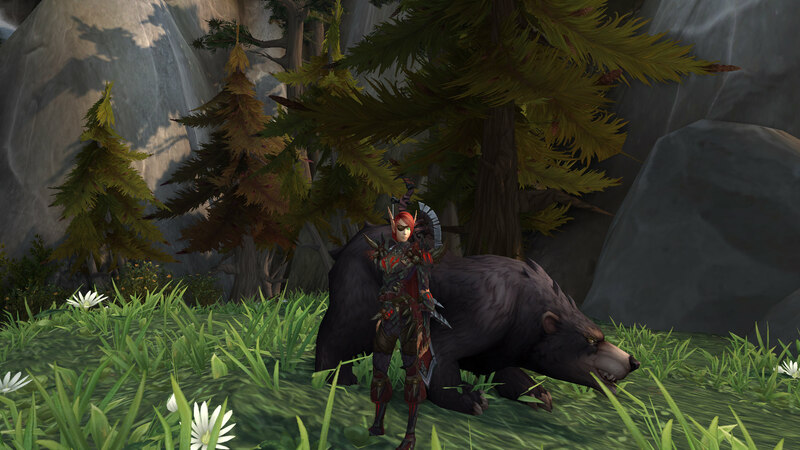 I laboured over leveling my new nelf huntress with one goal- to tame Rak'shiri. It took weeks to get from 50-57, a lot of that time spent in Winterspring doing quests and farming leather. I never once saw him spawned before I got to L57, even though I went looking for him every other day. 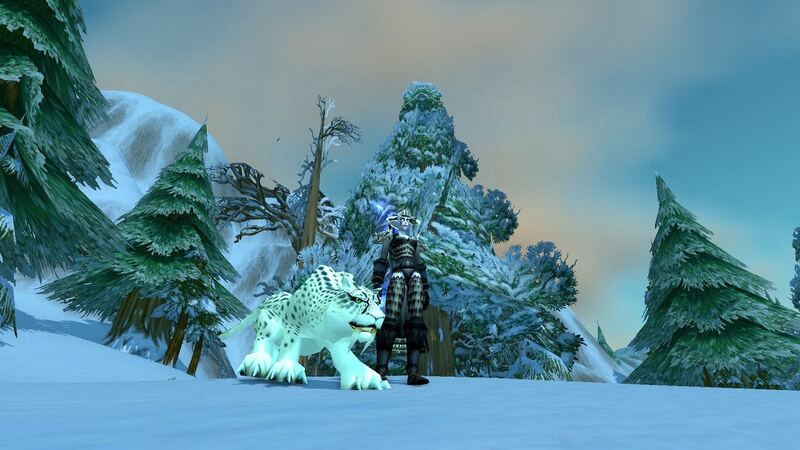 Finally the day comes when I ding 57, already in Winterspring, and I race to the top of the zone to prepare to sit and camp my new pet for as long as it takes... and there he is, prowling amidst the other sabres, just waiting for my elf. Hands shaking, the tame completed, and the beautiful aqua boy was mine, all mine. I couldn't believe my insane luck. 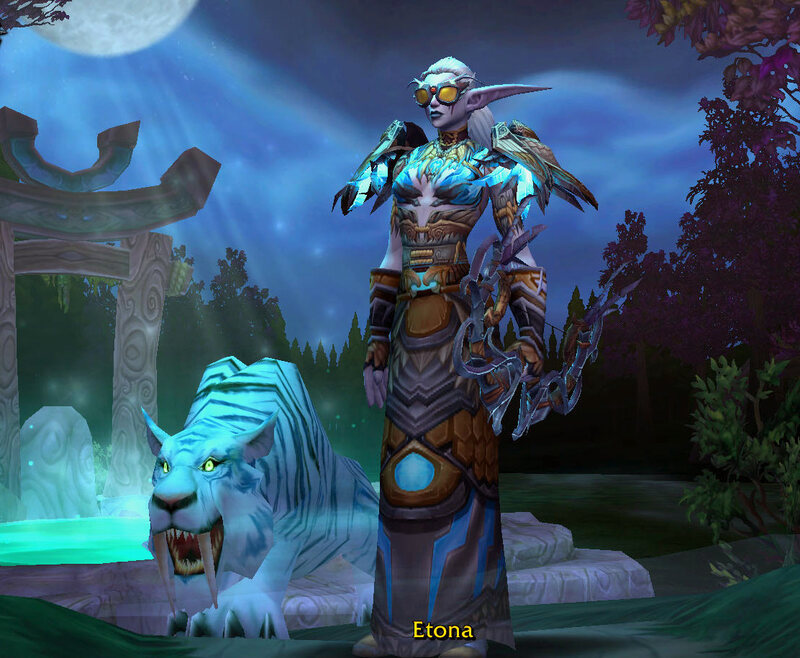 All throughout WoW and it's many expansions, Etona has kept her beloved sabre at her side. Though she's tamed many, many beasts over the years, Rak'shiri is her most beloved companion and still goes everywhere with her. Whenever there's new places to explore, she only trusts Rak'shiri at her side to face the unknown dangers. I LOVE hunter pets and have nearly completely filled up the stable of my main hunter. Of those pets, there are a constant 5 that I always carry with me and use for everything. The first of these pets is Rebellion, who’s wild name was Trigore the Lasher. I’ve been an on again off again player since Vanilla and the fearsome hydras left such a impression on me. I love their blocky necks and awkward waddle. And of these magnificent creatures, the gorgeous red Trigore was my dream pet. I camped for her for an entire month before I even saw her once! She always struck me as a wild and fierce creature, but loyal to the end. Of all my pets, she’s the one most likely to stare. The second is Senshi, a black jormungar worm. I tamed her on a whim and instantly fell in love! Up into Legion, she was my go-to tank and developed a personality of a kind but strict guardian. She’s quite intimidating if she doesn’t like you =P. As a mother, her love and gentleness knows no bounds. I’m glad to have such a dependable pet! She’s the pet most likely to go under a door rather than through it. The third is Maximum, who once went by the name of King Krush. 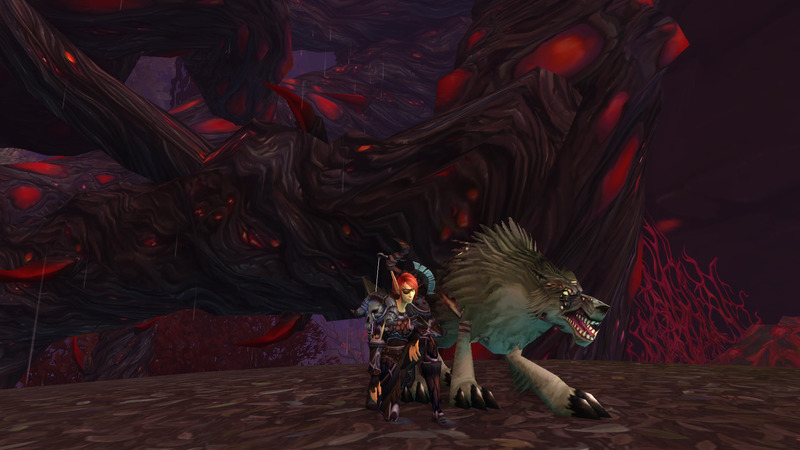 I tamed him in WotLK with a sham my buddy, another hunter, and quite a bit of luck. He was an incredibly difficult tame, but he’s worth every bit of it. When I PvP’d, Max was the one by my side. Over the years, he’s become my hunter’s best friend and I couldn’t imagine not having him. Silly Max is the one most likely to get stuck in a doorway. The fourth is Irritator, a Legion style gray basilisk. He’s got a temper and will snap at anyone who comes too close, with the exception of Rebellion. She seems to be the only one he likes but when push comes to shove, Irri is willing to put his own life on the line for his hunter. He is my main tanking pet now and with his family ability there’s no situation he can’t handle! He even once tanked a raid boss (who was already halfway through the final phase, but don’t tell him that)! Irri is by my side for the vast majority of Legion content and he’s pretty happy about it. He’s the one most likely to go for a swim. The fifth and final of these constants is also the newest: Hoshiko, once known as Antilos the whit hippogryph. Of all the Vanilla untameables, hydras and hippogryphs were the stand it families I wanted most. I used to visit Antilos in Azshara every day in WoD and Legion until he was finally made tameable. I like to think that he and my hunter grew attached to one another through their many encounters and one day he simply decided to join her on her adventures. Hoshi is proud and elegant, but also quite a scatterbrain. Sometimes he’ll even stop fighting to preen his handsome wings! Despite that, I can’t help but love him dearly. He’s grown to be my favorite pet and the one by my side most often. Hoshiko is the one most likely to perch on his hunter.....despite being bigger than horse. Luckily she’s a Tauren! Thanks so much for the helpful info, Krysteena! Teigan: Oh, thank you for the info! That's a lot simpler than I thought it was, tbh I'll definitely look into getting something done later today or something, thank you! 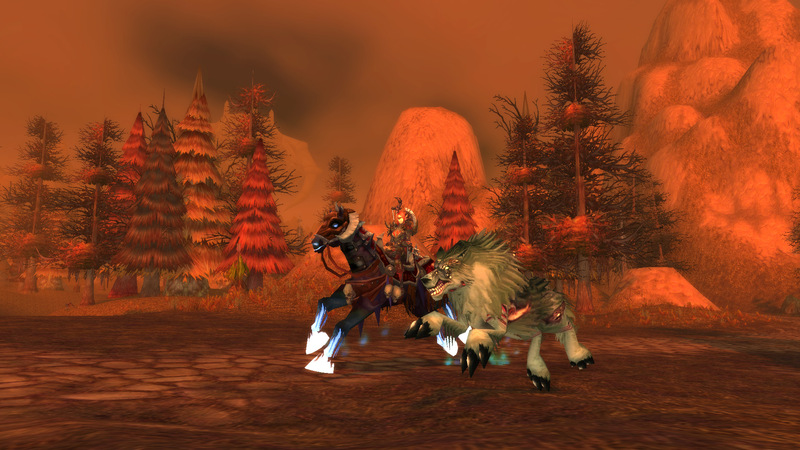 I remember first being new to WoW and wanting to be a hunter, solely because I was a pet lover.... I ended up taming my first pet and that's where the journey & addiction started. Never have forgotten that feeling, and still miss that feeling -- I also have a hard time abandoning any pets (I know, I know, they're just pixels) in my stables. 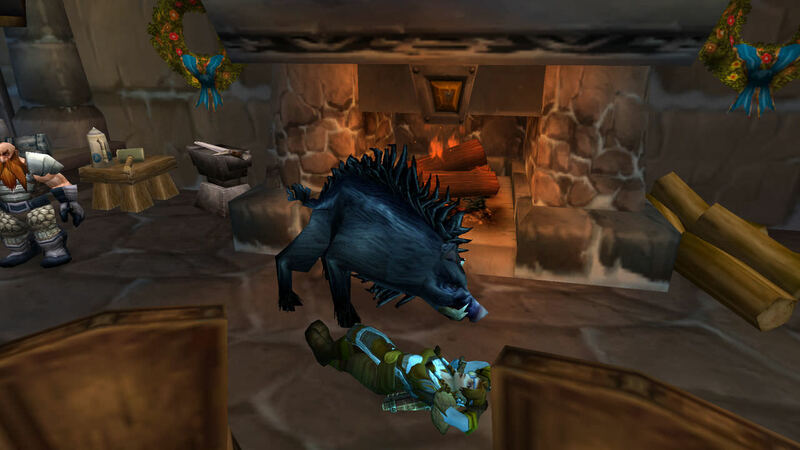 It's the best part of being and the reason for playing hunter, I wish Blizzard originally remembered that was the main reason, the pets. I wish Blizzard originally remembered that was the main reason, the pets.